The Israeli government's plans to make conditions tougher for Palestinian prisoners in its jails is drawing attention to a highly sensitive issue, says the BBC's Yolande Knell in Jerusalem. The entrance to the Abu Jihad Museum for the Prisoners' Movement closely resembles a jail. Step inside the revolving steel door topped by barbed wire and you stand behind bars that surround the ticket desk. Exhibits at the site, in the West Bank town of Abu Dis near Jerusalem, tell the stories of Palestinian political prisoners from the British Mandate period to modern-day Israel. Palestinians have come to view their experience of detention, for actions that oppose the occupation of their land, as part of their national identity. "It was important to establish this museum. Prison is a crucial part of the Palestinian struggle," says curator, Fahid Abu al-Haj. "The museum contains the suffering of more than 800,000 prisoners." The number is hard to verify, but few Palestinian families have never had a member in jail. The latest figures suggest there are 5,335 Palestinians in Israeli prisons for security or public order reasons, including 211 children. Some have been convicted of murder but others are detained and tried for political activities. Most have been dealt with by the Israeli military justice system, which is criticised by human rights campaigners. Mr Abu al-Haj himself spent a total of 10 years in jail, beginning in 1978. He had commanded forces belonging to the Fatah faction that has long led the nationalist cause. He was illiterate when he was placed behind bars but took the chance to get an education. Eventually he gained a degree and wrote a book on the life of a prisoner. "We struggled just to get paper and pens," he says, "but there are people who took the opportunity to build their personalities in jail." The treatment of Palestinian prisoners has become a hot issue as Israel marks the fifth anniversary of the capture of Israeli soldier Gilad Shalit. Militants from the Palestinian group, Hamas, attacked the soldier's tank in a cross-border raid into southern Israel in 2006. He has since been held in Gaza with no access to international humanitarian organisations. So far attempts to agree a prisoner exchange with Hamas have failed. "Everybody demands the immediate release of Gilad, and first of all a visit to him in captivity by the Red Cross," said Israel's Prime Minister, Benjamin Netanyahu, recently. "In addition, we decided to change the conditions of [Palestinian] prisoners. This celebration is over." The Israeli media reported that several Hamas prisoners had been placed in solitary confinement. Other Hamas inmates were then said to have refused food for 24-hours in protest. There have also been threats to withdraw privileges for those in jail such as academic studies, to put pressure on Gilad Shalit's captors. Supporters of Staff Sgt Shalit point to the fact that he is denied basic human rights by his captors in Gaza. Israeli newspapers raised the stakes with reports such as one in Maariv headlined: "Feasts and free internet: the good life of the terrorists in jail". It printed pictures, said to come from a high-security prisoner's Facebook page, showing him preparing a lavish meal and smiling while posing with other inmates. The report said this left the Israeli relatives of those killed in Palestinian attacks with their "blood boiling". Other papers highlighted prisoners' access to mobile phones, television and videos, as well as conjugal visits and what they claimed were flexible visitor conditions. It is difficult to draw an accurate general picture of how Palestinian detainees are treated by their Israeli jailors. Some of those convicted have similar living conditions to prisoners in Western countries, with limited access to television and exercise and occasional family visits. They can often obtain mobile phones through informal channels. But rights groups have also investigated certain interrogation centres where detainees have no access to lawyers and are harshly treated. They described them being held in isolation in tiny windowless cells with poor hygiene. Such conditions are similar to those in which Gilad Shalit is assumed to be kept. There is widespread frustration among Palestinians about the recent direction of Israeli public debate on prisoners. Israel recently arrested several activists in the West Bank who had been taking part in non-violent protests against the separation barrier, settlements and occupation. In the village of Nabi Saleh, 20km (12 miles) north-west of Ramallah, two cousins Bassem and Naji Tamimi, were arrested in March on charges of organising unauthorised marches, incitement and solicitation to throw stones. The men are being prosecuted in Israeli military courts and human rights groups question key evidence in the case. "We have been trying to make the whole world see the Palestinian people are not terrorists. It is our right to demonstrate against the occupation in a peaceful way," says a relative, Iyad Tamimi. Others in the West Bank complain of difficulties visiting their relatives in Israeli jails despite assistance from the International Committee of the Red Cross (ICRC). Ten-year-old Ghazali Sarahna lives with her grandparents in the Duheisha refugee camp near Bethlehem. She was a baby when her parents were convicted of transporting a suicide bomber to Rishon Lezion, south of Tel Aviv, where he killed two Israelis. Her mother insists she did not know of her husband's plans. "It gives Ghazali psychological problems," says Zeinab, the girl's grandmother. "She never had a chance to build a relationship with her mother and it's extremely hard for her to see her parents in jail." The grandmother says Ghazali is often turned back at the Israeli checkpoint as she doesn't have an Israeli identity card. She herself was once beaten by the soldiers, the grandmother adds. "Now [Ghazali] says it's torture whether [she] stays or goes to the prison," the grandmother says. For Nidal al-Azraq, from the nearby Aida Camp, incarceration is the high price to be paid for political activism. "Prison is really tough," he says. "The living conditions, the interrogation techniques. Many prisoners died. Look how many are very sick or blind. But in the end it's a step of resistance towards freedom from the occupation." All of Mr al-Azraq's siblings have been detained at some point. His brother, Khaled, was accused of organising attacks on the Israeli army. His latest jail term began in 1991. 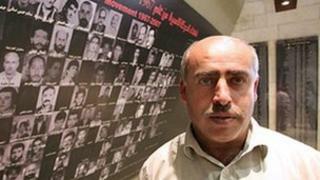 "Prisoners, we look at them as heroes, people who sacrificed years of their lives for others," Mr al-Azraq says. Such is the high esteem in which Palestinian detainees are held that many continue to wield great influence behind bars. Some Palestinian analysts warn that making their living conditions worse could prove counter-productive in efforts to free Gilad Shalit. A few left-wing Israeli commentators urge their politicians not to copy Hamas. They argue a society is judged by the way it treats its prisoners.